Today evening we saw LOVE, WARMTH, SELFLESSNESS and GIVING in action. While attending a free concert at the Warwick arts centre yesterday night, our two most amazing friends - Kak Yati and her husband Faizam, came up with a great idea. 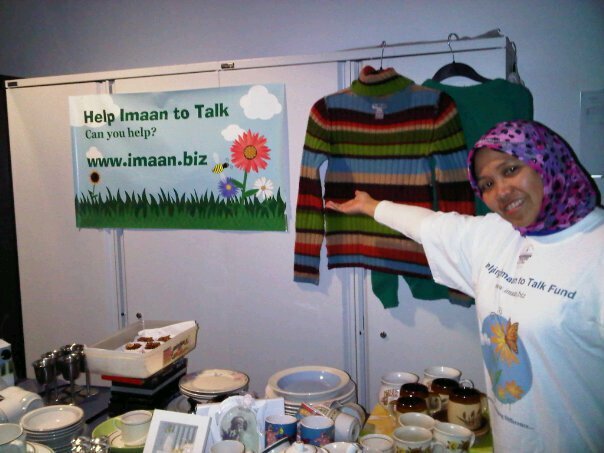 That is, to have a stall selling donated stuff to raise funds for Imaan, during the Freshers Meet n' Greet event organised by the Warwick MSA and the Coventry UMNO club today. Last night we went through the cupboards to search for unused items and Kak Yati contacted other friends as well, asking for unwanted stuff. Kak Yati and the family already had the stall up when we arrived at the event venue near the University of Warwick Library. Ka Tila was there helping out as well. The children, including Kak Yati's kids, Adam - our friend Sariman's son and Rahil, Imaan's sister, were really helpful, carrying items, handing out pamphlets and even promoting the products. Kak Yati's son, Fahmi was manning the till and did a great job collecting the money and handing out change when required. It felt surreal. Kak Yati is such a charismatic person and the items including crockeries, cutleries, clothes and other items were flying off the table. In the beginning, the table was packed with stuff but later on as the table cleared up, Faizam restocked it by bringing in more items from their van outside. We were happily surprised to see that our friends had donated so many items at such a short notice. Fahmi, Kak Yati's son had also baked some cookies which he was selling at 3 for 50p. We were shocked when we finally counted the total collections for the night, an amazing total of £285.87 £340.87 (Thanks to Faizam and a donor whom we don't know yet).Updated: 18th October, 2010. Besides raising funds, another objective was to create awareness about autism, about the Son-rise programme and about Imaan and we would like to think that we achieved this to some extent. We would like to thank the Warwick MSA and UMNO club for giving us this opportunity. We would be forever indebted to all our friends who kindly donated the items at such short notice. Thanks to everyone who donated and/or bought items. Thanks is due to Kak Tila who had come to spend some time but finally ended up staying the whole time, to Jo who dropped by for a while - thanks for your support, Kak Yati's wonderful children and Adam. Finally, our heart-felt gratitude goes to Kak Yati and Faizam, without whom this event would not have been possible in the first place. We plan to use the money to have a Son-rise child facilitator in our house again. We have been postponing this for a while. We shall be having another fund raising activity on the 17th this month. Ezura, Imaan's aunt is running the Wimbledon Audi 10K race and we are seeking donations for the event as well. Please visit the Fundraising page for more information. Kak Yati, Thank you again! You inspire us to do great things! and Faizam, our dearest Faizam!.. This man has donated a lot of things, particularly shoes; brand new shiny shoes were selling at £3 a pair! And he even delivered goods to buyer houses. Thank you ever so much Faizam, from the bottom of our hearts... We are humble by your kindness.